In March of 2015, Periscope was acquired by Twitter. Periscope is an application dedicated to live feeds. Users can watch live feeds and also host them. Viewers can comment during the live stream and like the broadcast with a simple tap of the screen. Tapping the screen gives the broadcaster more hearts which pushes them up in popularity. In the few months since Periscope has been relaunched for iOS, people have live streamed all kinds of things from concerts to weather reports and even training exercises. Today Periscope was officially released for Android devices. It’s available for free on the Google Play Store and it’s compatible with devices running Android 4.4 and up. It has material design and some added features over the iOS version. You can swipe between tabs instead of tapping them, and you can even return to a broadcast if you were interrupted by a notification on your phone. Users can also turn off notifications for when someone you follow has a live broadcast. For those wishing to view broadcasts on their tablets, Periscope is available in a tablet format, as well. If you’re interested in broadcasting your world, get started by downloading the app here. Then you can set up your account and start checking out live feeds and replays. 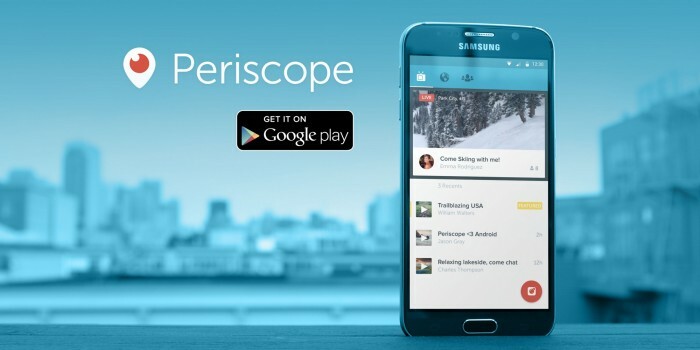 Will you be using Periscope now that it’s available for Android?